Need a companion to your sofa and loveseat? Choose this chair and ottoman set to complete your living room seating arrangement. Place this chair and ottoman next to an end table and sit back in the plush cushions and relax while visiting with family and friends or watching your favorite shows. The ottoman works well as an extra seat for when you have extra family or friends over. 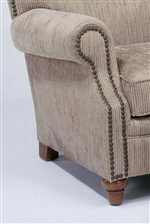 With rolled arms, decorative nail head trim, and turned feet, this set will surely add a stylish touch to your home. Enjoy a casual and relaxing atmosphere with this chair and ottoman set in your home. The Killarney Chair & Ottoman w/ Nail Head Trim by Flexsteel at AHFA in the area. Product availability may vary. Contact us for the most current availability on this product. 7860-08 Ottoman 1 24" 21" 17"
7860-10 Upholstered Chair 1 36" 38" 35"
Fabric Options Fabric, style: more than 100 frames to choose from and 1,000 fabrics. Love seats and companion chairs are also available. Furnish your home with the Killarney collection and experience comfort and style. Offering seating solutions for your living room, family room, den, entertainment room, and bedroom, this collection makes it possible for easy relaxation and comfort. Settle into the comfortable seats while you're visiting with family and friends, reading a book, watching your favorite shows, or enjoying movie nights. Offering more than functional value, design details such as nail head trim and turned feet add a stylish touch to the casual appearance of this collection. Bring Killarney into your home and sit back, relax, and enjoy a warm and welcoming living atmosphere. The Killarney collection is a great option if you are looking for Casual furniture in the area. Browse other items in the Killarney collection from AHFA in the area.